Author info: Valerie Riley is Senior Manager of Marketing Communications for Info Tech, Inc. She and her husband Brent are working parents to two school-age children. With the school year here, the parenting time crunch is starting to set in. For Gainesville’s dual working parents, this means that those precious hours between the end of the work day and bedtime become a whirlwind of homework, activities, conversation and nighttime rituals. Getting a healthy meal on the table can be the hardest part of the equation. I asked some parents around town to share their best tips for accomplishing dinner and I got a range of responses. Many were excellent planners, able to choose meals that are easy to prepare, purchase ingredients during a weekly shopping trip and then execute those meals each night. Some even tag-teamed where one parent cooked on one evening and another cooked the next to share the burden. Others preferred to grocery shop daily and prepare a meal on the fly – even though that meant a pretty late dinner seating. For those that need outside help, though, there are a surprising number of choices around town for both prepared meal delivery and meal-preparation kits. Jorgia McAfee is a busy mom of a 5-year old child juggling her job as VP of Development at Crime Prevention Security Systems and also working as an actress. Her husband Bobby McAfee also works at Crime Prevention Security Systems as Marketing Director. 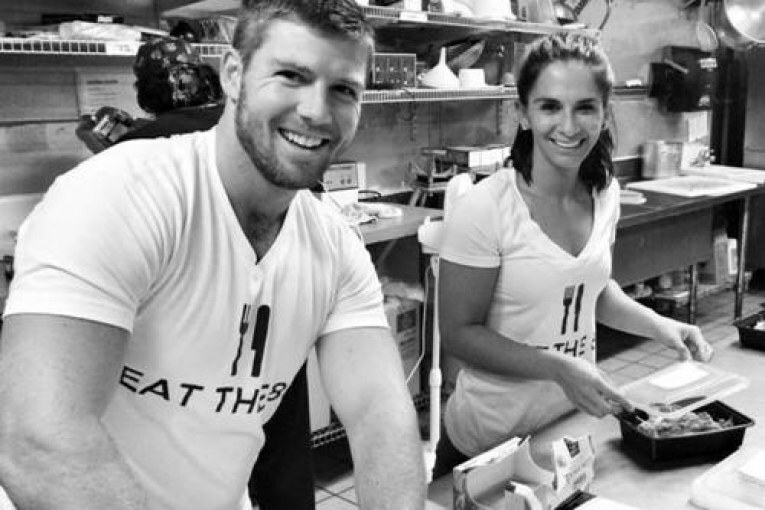 For about a year they have been clients of Eat the 80, described as “a healthy meal delivery service.” Eat the 80 was started right here in Gainesville, so the meals are prepared in a local kitchen and delivered to clients. The McAfees get five meals per week delivered by Eat the 80, but it is mainly for the adults in the home. “My son is a very picky eater, so he hasn’t eaten much of it yet,” Jorgia says. Overall, it is a big hit with the adults due to the convenience. The McAfees also find that the energy required to prepare meals had previously been draining. While the McAfees are receiving their meals already prepared, other local families use a service that provides ingredients to prepare a meal at home. The service, called Chef Ami, provides the ingredients for a meal and delivers the kit to your home. Meals typically take about 30 minutes to prepare and serve four people. Like Eat the 80, Chef Ami is also based in Gainesville. The DeGroffs are clients of Chef Ami. Curt DeGroff is a physician UF Health, his wife Coleen is a Realtor for RE/MAX Professionals and they have two sons, ages 21 and 18. The DeGroffs began using a meal ingredient delivery service when they found that both planning healthy meals and executing them became a struggle. The family has been using Chef Ami for more than a year. The DeGroffs prepare a Chef Ami meal at least three times per week and have yet to have a meal they didn’t enjoy – and that includes the kids. The DeGroff boys even get in on the meal preparation. The whole family will use any leftovers for lunches. In addition to these two services, there are other choices for dinner help in town. What’s For Dinner? is a local company that can deliver meals and even provide in-home chef services. Delicious Delivered is another local option providing pre-prepared meals. Nationally, options abound including Hello Fresh and Blue Apron, which deliver meal preparation kits all over the US, and Healthy Chef Creations which delivers pre-prepared meals nationwide. For working parents, a family dinner is a great evening ritual to re-connect and share the day’s events. There are several choices in Gainesville beyond take-out menus and drive-thrus to put a quick and even healthy meal on the table.